The 6th – 10th March is National Apprenticeship Week, and Audience Systems are proud to be taking on a growing number of apprentices in all areas of our business. 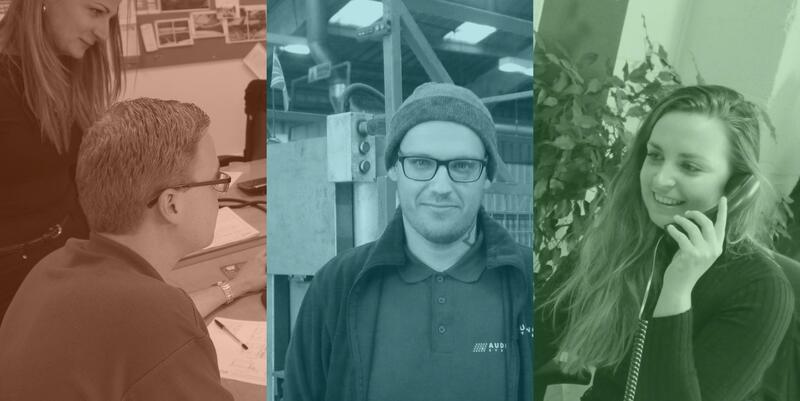 Currently we employ three apprentices in our production department, all learning welding, fabrication and engineering skills both on the job and at local colleges. You can read some of their stories on our Apprenticeships page here. But apprenticeships aren’t just for production roles. Later this year, we will be taking on more apprentices in other areas of the business, including in office-based jobs. We see great benefits in offering apprenticeships. Skills shortages in our local area, combined with Wiltshire’s relatively high levels of employment, mean it’s often a challenge to recruit people with the right skills. Taking on apprentices allows us not only to overcome this, but also to train people in a way that’s tailored to the needs of our business. At the same time of course, apprenticeships are a really positive way we can contribute to our local community and economy. Apprentices at Audience Systems naturally enjoy the same package of benefits as all our employees including a 4 or 4.5 day working week (depending on role), holiday pay, company sick pay and pension. We’re always interested to hear from people interested in apprenticeships in any areas of our business, from sales, project management, purchasing, finance and IT to engineering, production control and manufacturing. We also hold annual open days for people interested in working for us. If you’d like to find out more, please contact Hannah Martin, our HR Manager on 01373 865050 or email hmartin@audiencesystems.com.